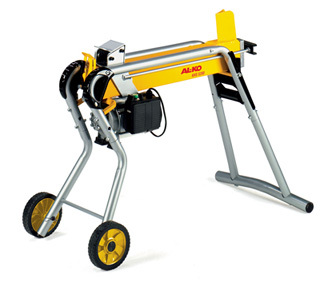 The AL-KO KHS 5200L is an easy to use electrically powered hydraulic wood splitter which is quiet in operation, yet an effective and efficient machine for heavy duty domestic use. Suitable for splitting logs up to 520mm long, with a maximum force of 5 tonnes, the AL-KO KHS 5200L has an adjustable frame allowing the splitter to be used at the most conformable height. The wide transport wheels allow safe movement of the machine on all types of surfaces. Double activated switches ensure operator safety as the splitter will not operate unless both switches are simultaneously depressed, thereby ensuring that hands are kept well away from the splitting action. Delivery of this item is FREE to addresses in Norfolk and the Waveney Valley area of Suffolk. Please note that we supply AL-KO logsplitters fully assembled and ready for use. One of our own sales and service engineers will deliver to cusotmers in this area and give full instructions in the use of the machine. In order to provide our full service for AL-Ko logsplitters, we do not offer nation wide delivery of this machine.